BGSU staff member Anne Lake shares a review of a new CSCL title. You will find Splintered in the hallway of the CRC and in the catalog here. So many people have said such good things about this book, and yet going into it I somehow had no idea what I was in for. 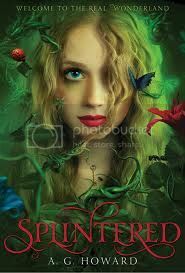 Splintered is a modern “sequel” to the classic Alice in Wonderland. Alyssa, great-(great? )-granddaughter of the original Alice must go back and fix everything Alice screwed up the first time. The other really important part of this book is its examination of how we treat those we think are “insane.” Alyssa’s mother has been in the insane asylum for years and before we head down the rabbit hole we get a good look at how the rest of the characters react to her. While we’ve certainly come a long way from electrocution and lobotomies, conditions still aren’t great. The poor woman is sedated within an inch of her life. Alyssa visits her because she knows she should, but she’s still repulsed and ashamed by her own mother. It’s a terrible thing to see, but it really opened my eyes to some issues I’m not familiar with. But the thing that really blew me away about this book was the imagery. Once can see that this is the Wonderland from the original, but where Alice was an intruder, Alyssa is invited and has help (such as it is) from those on the inside. The different perspective makes the view of Wonderland raw and new, and it has an inherent beauty that is incredible! I really enjoyed this book for all its unusual elements. This is one I’d recommend to anybody, no questions asked.